From manta rays to mantis shrimp, dolphins to dartfish, or voracious sharks to vibrant soft corals, NAI'A has found Fiji's ultimate dive sites. Experience the diversity and drama of pristine coral reefs at their most colorful and lavish. We are excited to offer the Nai'a liveaboard with dive charters to Central Fiji. Central Fiji has the best diving, no doubt about it. This "NAI'A Triangle" of Lomaiviti, Bligh Water and Namena is the focus of the regular itineraries, covering about 500 nautical miles. NAI'A has journeyed throughout Fiji, in all directions and to every corner of the country's boundaries -- and beyond. Beautiful sites and dramatic attractions are found in every region and new places yet to be explored. But the central region has proved the most consistent in the quality and health of terrains, animals and conditions. Lomaiviti's coral reefs and islands are Fiji's most dynamic and varied: voracious sharks to vibrant soft corals. 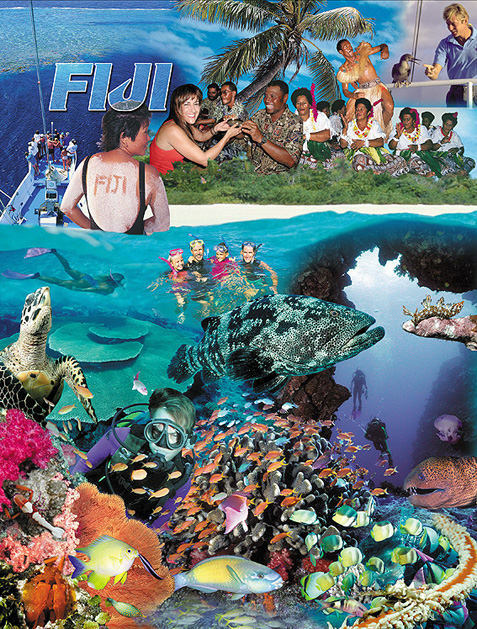 Fiji's coral reef system is a complex web of barrier reefs surrounding large lagoons and islands. Coral growth and fish action are most robust on those outer barrier reefs. Marine life is especially concentrated within the reef passages and channels that link the lagoons with the deep ocean. But the barrier reefs are remote and vast - a long way from shore bases - so only the best-equipped live-aboard diving vessels can access these locations. Much of the area remains uncharted and the dive sites untouched. All this makes NAI'A dive sites in the NAI'A Triangle of Lomaiviti, Namena and Bligh Water largely exclusive. You are extremely unlikely to encounter another dive boat during a NAI'A trip -- it will feel like your own private pristine Fiji. The normal itinerary for both seven and ten-day charters starts and ends in Lautoka, just north of Nadi, where the international airport is located. After an initial "checkout" dive on the afternoon of boarding, NAI'A heads north and east around the flank of the main island of Viti Levu to reach Bligh Water. Several different divesites in Bligh Water are available including Vatu-i-ra, E6, Mt. Mutiny, and Cat's Meow, depending on localized weather conditions. From there we choose our sites according to weather, tides, and our passengers' inclinations. But generally we visit the islands and barrier reefs of Namena, Wakaya, and Gau. On ten-day charters there is more time available to dive the various reefs in the Koro Sea, some of them near Namena and others near nowhere! We have limited availability for 2013 charters, better space availability in 2014, and many open charters in 2015. Pricing for the 2013 and 2014 7 day cruises start at $3440 pp inc tax and 10 day cruises start at $4914 inc tax. Contact us for charter details today...! Maluku Dive Resort - Ambon, Indonesia - Muck diving "Critters Without Crowds"
We are showcasing this resort for the Beneath The Sea Dive Show March 22-24, 2013. We are pleased to be offering another fantastic dive resort in the "Muck Diving Captial of the World." The Maluku Divers Resort in Laha is one of the must visit locations in any diver’s Indonesian dive list. The only dedicated dive resort in Ambon, the facility was built specifically with divers in mind and boasts the most unique and comfortable accommodations in the whole of Maluku. Each individual bungalow is over 60 square meters, with private bathroom, hot water, air conditioning and a large covered private wooden terrace. Each bungalow also has the unique feature of individual editing desks for each diver. The ten bungalows look out over Ambon Bay and the incredible muck diving and critter sites to be found there, the ultimate location for diving Ambon. Ambon is undoubtedly famous for the world class muck diving, with a huge array of critters that can be observed and photographed during long dives at the shallow sites close to the resort. 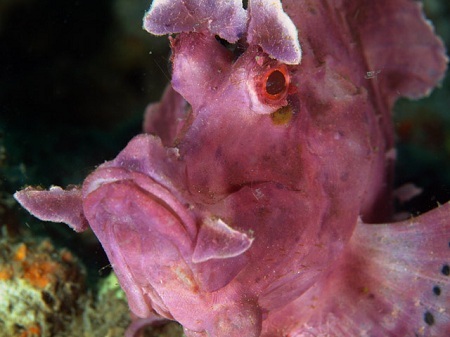 Diving in Ambon includes regular sightings of resident marine life such as rhinopias, many assorted frogfish, mandarin fish, ghost pipefish, harlequin shrimp, flamboyant cuttlefish, blue ring and hairy octopus, thorny and pygmy seahorse, stonefish, inimicus, to name but a few, along with literally hundreds of different species of nudibranch. As the Maluku Divers Resort is the only dedicated dive resort within Ambon Bay, it is “Critters Without Crowds” when diving in Ambon. We have amazing packages to Maluku Dive Resort offering 7 nights accommodations, meals, and 3 boat dives per day plus unlimited house reef dives starting at $1550 per person with discounts for added days if you extend your vacation. Email us for details and let's blow bubbles in Ambon!